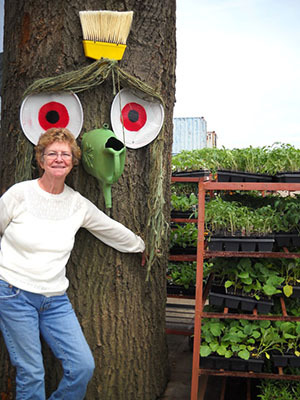 She’s been referred to as the “fairy godmother” of community gardens in Akron, Ohio, known for her art of turning “trashed” areas into treasured gardens of beauty. The late Elaine Evans sure left a legacy and impact on this city that will be remembered forever. 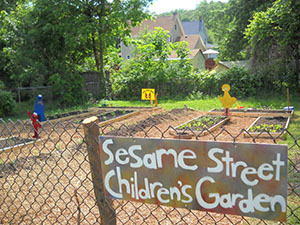 “(There was) a magic that she created by creating these gardens and then watching what happened in the neighborhood. She’s been adding her little gardening fairy dust to neighborhoods that most people would rather just drive through,” Sarah Vradenburg, a Master Gardener, recalls. “Elaine stopped and took a look around and said ‘This can be better. I can make this better.’ And did that,” Vradenburg, who also wrote an article on Evans for the Akron Beacon Journal, continued. Sadly, Evans passed away at 75 years old on January 9th from cancer. But her heart, Let’s Grow Akron (LGA), lives on. 2013 marks the 25th year of the LGA’s incorporation, but Evans started the project in 1988. “People are coming out of the woodwork with stories of how Elaine touched their lives,” Lisa Nunn, Executive Director of Let’s Grow Akron said, while sharing large photo albums filled with pictures of Evan’s work and the children whose lives she touched. 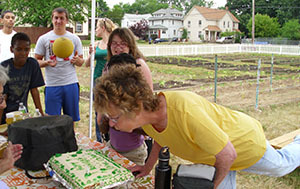 Evans was a single mother and well-known for her craft of turning hundreds of vacant lots into beautiful garden spaces, full of flowers and edible plants. “Elaine has probably worked with every segment of the population. She’s put gardens in at the jails, community-based correctional facilities, women’s shelters, schools… She’s worked with a lot of the different immigrant populations that have come through, (even) the Hells Angels. You name it, any sector of the population she has worked with. And, typically low income folks, kids, seniors, families. All ages, all groups,” Nunn said. Evans first got the idea for LGA while working a “normal” job. She ended up quitting her job to start this endeavor in one of the back bedrooms of her house. “She started in response to working for the city’s planning department. One of her jobs was to go out and respond to calls and complaints about empty lots that were overgrown or ridden with trash, rodents and vandalism. So she would go out, do the research to find out who owned the property and try to contact that person to clean it up,” Nunn explained. “Most times the city would have to come in and clean it up because that person was delinquent on their taxes and moved out of town, or died, and the family wasn’t keeping it up. So the city would go clean it and then send a bill to the owner which often times was unpaid,” she continued. 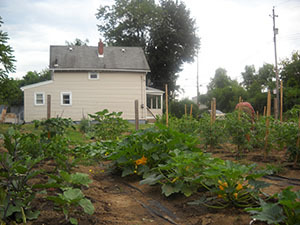 Most of the lots were located in low-income neighborhoods. “She saw the need and the space available and was inspired and encouraged by a pastor friend of hers to turn it into gardens,” Nunn said. “Originally Elaine told me she wanted to write a letter to the Beacon Journal about it, that something must be done. But her pastor said, ‘Why don’t you do something?’ You know how to garden, why don’t you teach these people to clean this up and to garden?” Nunn shared of its beginnings. “So that’s exactly what she did. She just started knocking on doors in neighborhoods that were surrounding these empty lots and people responded really positively to it. 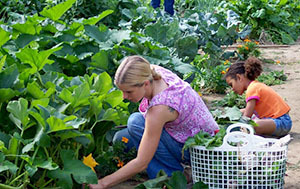 They would help her clear trash and sometimes it would be tires and broken glass and all kinds of stuff that they would pull out of these lots and turn them into flower and vegetable gardens that they would be able to eat and feed themselves,” she continued. 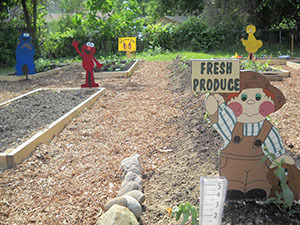 Little neighborhood gardens started sprouting up everywhere! Evans did all that it took to help others, and never gave up. 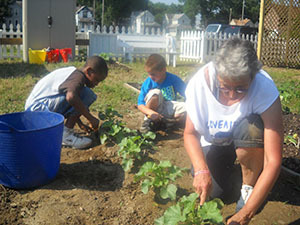 “I worked at the Beacon Journal and you hear about people who are doing things in the community and when I heard that there was this woman that was going around and trying to improve the more distressed areas of Akron by planting gardens, my heart leapt! I thought ‘somebody is finally doing it the right way,’ other than let’s tear things down and build them new and all that kind of stuff . Someone was actually getting at the esthetics and helping people feel proud of their community,” Vradenburg said. When working on Evans’ story for the Beacon Journal, Vradenburg came to admire her dedication. She remembers Evans being wheeled in a wheelchair to one of the gardens. She didn’t let anything, or anyone hold her back! “That (moment) cemented for me the absolute commitment that she had to the neighborhood - to the idea that gardens really are an integral,” Vradenburg said. She also recalls times when Evans would fill barrels of water and wheel them up to Summit Lake for the gardens. “I am now a Master Gardener and work with people who are trying to start community gardens, or maintain them, and there’s no place you can go in Akron where people don’t say ‘oh are you a part of Lets Grow Akron?’ Community gardening and Lets Grow Akron are synonymous. 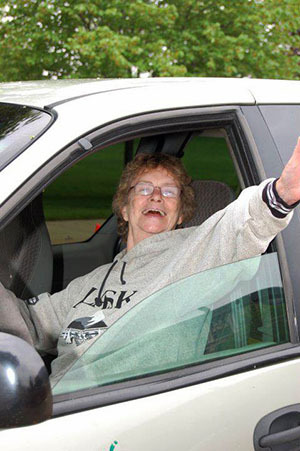 It’s a testament to how tireless Elaine has been for 30 years,” Vradenburg said. Elaine Evans will be greatly missed. 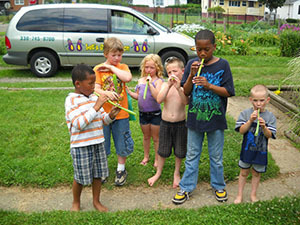 Part Two of the story posted next will share more of Evans’ heart for the community and the works she was involved in, as well as how Let’s Grow Akron will continue to bloom in the future.